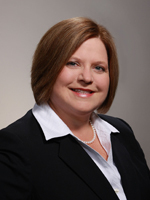 Colleen K. Conrad, CPA, serves as Executive Vice President and Chief Operating Officer of NASBA. She is responsible for all operations of NASBA including CPA Examination, Licensing, Continuing Education and other services and products, as well as IT and risk management. Conrad also oversees governmental, international and professional relationships. In her role, she utilizes her wealth of accounting expertise, legislative abilities and grasp of accounting issues—both domestic and international—to benefit Uniform CPA Examination operations and the State Boards of Accountancy. Conrad brings more than 25 years of accounting expertise and leadership to NASBA. As a former Partner in a regional CPA firm, she practiced in the firm’s Real Estate Services Group, providing real estate attest, tax and consulting services to clients nationwide. Her wide-ranging consulting expertise included forecasts and projections, business planning, acquisition and disposition of business interests, financing, loan workouts and restructuring, and operational reviews. From 1997 to 2007, Conrad served on the Missouri Board of Accountancy, with two terms as chair. Conrad’s contributions to NASBA date back to 1997 as she has served as a committee member and a featured speaker during NASBA forums. Her committee involvement included serving as a member of the Strategic Initiatives, Bylaws, Regulatory Response and the Education Committees. As a NASBA Annual and Regional Meeting presenter, on numerous occasions, she has provided insight on various topics related to the Uniform CPA Examination. A long-time member of the American Institute of Certified Public Accountants (AICPA), Conrad has served as a member of AICPA Council. In addition, she was a member of the AICPA Board of Examiners for 10 years, serving one term as its chair, and was also a member of the Joint AICPA/NASBA International Examination Task Force. Conrad served on the BOE during the crucial transition from a paper-and-pencil to a computerized examination. Conrad, a Kansas native, currently serves on the Financial Accounting Standards Advisory Council (FASAC) which advises the Financial Accounting Standards Board (FASB). She is also a member of the Tennessee Society of CPAs and past president and member of the St. Louis Society of Women CPAs. Among her numerous honors, she was named as an AICPA/Missouri CPA Woman-to-Watch, Experienced Leader, in 2008. A noted lecturer and author of numerous articles in tax and real estate publications, Conrad earned a Bachelor’s degree in Accounting from Truman State University and became a licensed CPA in 1987. She recently served as chair and board member of the University’s Accounting Alumni Board. She also has been active in the community by serving on the board of the Better Business Bureau of Eastern Missouri and Southern Illinois, the Foster and Adoptive Care Coalition of Greater St. Louis and The Alexandria Ballet Company. In her spare time, Conrad enjoys the outdoors, photography and traveling.